Hybrid cloud is shaping a new network reality, and now is the time to ensure your network is ready across all your locations. According to 451 Research, 60 percent of IT environments will reside in the cloud in 2018—up from 45 percent in 2016.The mix of on-premises and cloud-based resources that underpins the hybrid cloud means increased complexity, and legacy networks are simply no longer equipped to meet demands created by bandwidth-intensive environments. Join us on June 28 at 1 p.m. ET for the “Taking Complexity Out of Connecting to the Cloud” webinar. Our expert panelists will discuss the issues related to operating in a hybrid cloud. • John Keller, director, product management, Data Center/Cloud at Comcast Business, works to build products and services for Comcast customers through private, direct connectivity to multi-tenant data center and cloud service providers. Whether it’s caused by hardware failure, human error, natural disaster, cyber-attack, or other issue, downtime can have a serious impact on your business. Your employees and customers expect constant connectivity and a seamless experience. Fortunately, the cloud’s 24/7 anytime/anywhere service, elasticity, immediate connectivity, automated backup, and related features make it easier to maintain business continuity. More than 81 percent of enterprises recognize the BC/DR advantages of the cloud and employ a multi-cloud strategy, and more than half (51 percent) have a hybrid cloud strategy, according to RightScale. While the hybrid cloud can optimize business continuity, it needs to be architected to do so. Join us on February 23rd at 1 p.m. ET for ““Business Continuity in the Hybrid Cloud: The Obsolescence of Downtime,” a webinar from Comcast Business, to learn from our expert panelists how to develop an infrastructure that considers business continuity—and keeping downtime at bay—as a core function. • John Burke, principal research analyst, Nemertes Research. John advises key enterprise and vendor clients, conducts and analyzes primary research, and writes thought-leadership pieces across a wide variety of topics. • Zabrina Doerck, senior manager, advanced data marketing. Zabrina drives GTM strategy for Comcast Business’ connectivity solutions, including cloud and data center connectivity, SD-WAN, and managed services. The benefits of Gig speed and greater capacity are clear. Massive upload and download speeds when compared to 12 and 24 Mbps speeds; the ability to connect hundreds of devices to your network and not experience any degrading of speed and performance; easy, simplified connectivity; improved application hosting; greater failover and redundancy—all geared to scaling with your company and network needs. Join us for “Raising the Bar on Connectivity: A Gig Speed Case Study,” a webinar from Comcast Business on Thursday, May 23 at 1 p.m. ET. Our expert panelists will explore how the addition of 1 Gbps ENS circuits and several 100 Mbps circuits to the Shields Health Care Group’s network improved operations in nearly every phase for the company’s 30 locations. According to Futuriom’s 2018 SD-WAN Growth Outlook, produced in October 2018, the market for SD-WAN tools and network-as-a-service (NaaS) revenue should reach $1.5 billion this year and $2.5 billion by 2021. Clearly, adoption is on the upswing. Yet, for all its mainstream appeal, there remain several myths about what SD-WAN is—and what it isn’t. Join us on April 25 at 1 p.m. ET for “Myths and Realities of SD-WAN,” a webinar from Comcast Business. Our expert panelists will help dispel some of the key misconceptions about the infrastructure, budget, and other impacts of SD-WAN. In this webinar, we’ll bust five core myths, while offering a valuable reality check. •John Burke, CIO and principal research analyst, Nemertes Research, advises key enterprise and vendor clients, conducts and analyzes primary research, and writes thought-leadership pieces across a wide variety of topics. •Jeff Lewis, vice president of product management for Comcast Business. Jeff oversees the company’s evolution of next-generation networking, cloud, data center, Wi-Fi, and Internet solutions for business. Improving the customer experience (CX) is among the most important--if not the most important--benefit of and driver for digital transformation. In fact, IDC research reveals that two-thirds of CEOs at Global 2,000 companies intend to shift their focus from traditional, offline strategies to more modern digital strategies to improve the customer experience before the end of this year, with 34 percent of companies believing they’ll fully adopt digital transformation within 12 months or less. As a core component of digital transformation, your edge locations play a vital role in generating revenue and enhancing customer loyalty. When your edge locations experience poor performance, your reputation with customers and your bottom line are put at risk. Eliminating blind spots with end-to-end network visibility in an environment in which end users, apps, and infrastructure are more distributed than ever is key to optimizing the customer experience. • Teresa Ward-Maupin, vice president of Customer and Digital Experience at Comcast Business. • Zeus Kerravala, founder & principal analyst, ZK Research, provides a mix of tactical advice to help his clients in the current business climate and long-term strategic advice. According to Nemertes Research, among the core technologies supporting digital transformation are cloud, analytics, collaboration, contact center, and mobility. Key to harnessing the power of those technologies is Unified Communications and Collaboration (UCC) and organizations are increasingly aware of it potential. In fact, Nemertes’s data shows UCC spending increased by 46.2 percent in 2018. Like digital transformation itself, UCC and its related technologies have the potential to aid in process improvement, customer engagement, team collaboration, and more. In “The Critical Role of Unified Communications in Digital Transformation a webinar from Comcast Business on Thursday, February 28th at 1 p.m. EST, our panelists will walk you through the key drivers enabling UCC and its impact on digital transformation initiatives. •Irwin Lazar, vice president and service director at Nemertes Research, develops and manages research projects, conducts and analyzes primary research, and advises numerous enterprise and vendor clients. He is responsible for benchmarking the adoption and use of emerging technologies in unified communications and collaboration. •Jeannette Romero, product management executive director for the Comcast Business Voice product portfolio, leads the development and lifecycle efforts for Comcast Business Class Voice, Mobility, VoiceEdge Select, Business VoiceEdge, PRI, and SIP products. Data tells us that digital transformation is the focus of nearly every discussion on organizational strategic initiatives. According to the Economist Intelligence Unit, 77 percent of businesses state that digital transformation is their first strategic priority. The MIT Sloan Review reveals that 90% of CEOs cite enterprise-wide digital transformation as a core objective of their digital strategy. Given its potential for meeting new business opportunities, empowering frontline employees, automating data collection, storage, analytics, generating insights that feed critical business intelligence needs, and more, that’s not a surprise. Yet, fewer than 15 percent of early maturity digital enterprises have a clearly defined digital strategy. There simply is no roadmap. But sound examples of successful initiatives exist. Our panelists will walk you through the process Philadelphia Federal Credit Union (PFCU) took in beginning their journey toward digital transformation, starting with moving its network from an MPLS environment to SD-WAN. •Richard Costello, IT Manager for Philadelphia Federal Credit Union (PFCU), provides support for everything from database servers and e-mail servers to virtual infrastructure. He has also been involved in several upgrades at PFCU, including core infrastructure, phone system, wireless network replacements, and LAN/WAN data. •Jody Hagemann, director of product management, Comcast Business Services, focuses on service operations design, new product launch, and lifecycle management. Currently, she’s developing the Comcast Business ActiveCore℠ platform. The perspective on Digital Transformation to date has focused on the issues associated with traffic steering and other factors related to optimizing networks for enriched customer experiences, improved organizational communication, and improved efficiencies across the board. But, what’s next? Cloud computing, data analytics, social media, and mobility have helped organizations move more rapidly toward digital transformation, but how will emerging technologies create the next leap? How will virtual/augmented reality, blockchain, Internet of Things (IoT), Artificial Intelligence (AI), advanced data analytics/predictive analytics come together, along with software-defined networking, to drive digital transformation efforts that will completely change the way networks and companies work? In “Digital Transformation 2.0 Drivers and Disruptors: Is Your Network Ready for the Future?” a free webinar from Comcast Business on Tuesday, December 18 at 1 p.m. EST, our panelists will look to the future, helping to unlock the possibilities these disruptive technologies might offer. • John Brzozowski, fellow at machineQ, a Comcast service. As Head of Engineering for Comcast machineQ, John and his team are responsible for core IoT technology development and infrastructure engineering, including architecture, design, and development for both software and hardware. Join us on November 15th at 2 p.m. ET for “Driving Digital Transformation Through 2019 and Beyond,” a webinar from Forrester Research and Comcast Business, where our expert panelists will explore the key considerations for successful advanced data network technology adoption and long-term strategy. •Why Digital Transformation is not a “one-and-done” concept. •The changing narrative around Digital Transformation, as we shift from adding digital features (1.0), to having digital become a core part of an ongoing enterprise strategy (2.0). •The ways in which the continuous transformation and evolution of a company’s digital initiatives requires a complete re-think of your business’ go-to-market, including how you interact with your customers, how you drive operational excellence, how you approach innovation, and the technologies you use as the foundation. •Why companies using advanced data networks to embrace Digital Transformation 2.0 experience proven gains in customer satisfaction, revenue, and employee productivity. •The technologies you can put to work on your own Digital Transformation journey. •Andre Kindness, principal analyst at Forrester Research, serves IT Infrastructure & Operations Professionals. He is a leading expert on enterprise network operations and architecture. His research focuses on networking technology and strategy—such as software defined networking and network function virtualization—for private cloud, remote locations, and hybrid cloud. •Allan Langfield, executive director, product management at Comcast Business, is responsible for Product Management, Development and Deployment of the Comcast NFV platform, ActiveCore. Allan’s group is focused on delivering a customer-oriented Digital Experience, enabling and integrating services including SD-WAN. What’s next in digital transformation? It’s the evolution of the “enterprise edge,” an emerging services hub for the collection and distribution of data and as a key enabler in the transformation to a digital-native enterprise. It plays a central role in meeting new business opportunities, from empowering frontline employees, to automating data collection, storage, analytics, and insights that feed critical business intelligence needs. Our expert panelists will explore the ways in which successful transformation of the enterprise edge creates an evolution of the enterprise network architecture, fueling the next leg of digital transformation. It aligns all organization resources, including key assets closer to the edge, to offer operational advances, richer customer and employee experiences, and higher economic rewards. •How a transformed network edge helps meet demands for speedier decision-making, unlimited and quick access to cloud applications, and stricter quality of service parameters. •The role of “disruptive networkers” and how they leverage advanced data networks, such as SD-WAN, the cloud, and automation. •Understanding where your company fits on the Digital Journey Index which was developed by IDC in conjunction with Comcast Business, to help track the progress of your digital journey. •New architectural choices that allow enterprises to transform to digital-native and move toward a more intelligent, automated, and flexible network that allows them to react quickly and effectively to a changing business environment. •Ghassan Abdo, research vice president in IDC’s Telecommunications group, covers the evolution of the Telco Cloud Ecosystem as well as the emerging Virtualized Enterprise Networking services. A range of powerful technology platforms—mobility, high-performance wireless, AI and the Internet of Things (IoT), smart connected solutions, fast deployments, and of course, digital transformation—share the same backbone: Ethernet. It’s the power behind the seamless delivery of a wide range of applications across networks for an increasingly broad array of industries, including finance, healthcare, retail, federal and municipal organizations, energy, and IT, among others. Join us on September 27th at 1 p.m. ET for “Ethernet: Building a Bridge to Digital Transformation,” a webinar from Comcast Business, where our expert panelists will explore the role that Ethernet plays in digital transformation, particularly in supporting networks and enterprises. overall quality and service management. applications from the core to the edges of your Wide Area Network. easy integration for IP networks, and network simplification. telepresence, and BD/DR, and more. • Wayne Hickey, Advisor, Product Marketing at Ciena. His focus is on building solutions to all market segments. As we head into the 4th quarter, your business needs to be ready for the increased traffic and pressure your network will experience. Holidays, the advent of the football and basketball seasons, back-to-school, vacations, budget planning… In fact, since 2010, the concentration of bandwidth-critical events is higher in Q4 than at any other time of the year (Statista 2018). No matter your industry, the impacts can be felt across the entire business ecosystem. Building a bulwark against the seasonal variation created by increased consumer and commercial activity, and the resulting pressure on your network to meet those demands, can be your best defense. Join us on August 30th at 1 p.m. EST for “Is Your Network Ready for the Busy Season?,” a free webinar from Comcast Business. Expert panelists from Nemertes Research and Comcast Business will help you get ahead of the challenges and opportunities presented this time of year and plan next year’s priorities. •Steps you can take to upgrade and safeguard your existing architecture today. •Solutions designed to shore up your network, including, cloud, multi-WAN, wireless backup, and more. •Long-term planning to prepare for future network fluctuations. •John Burke, principal research analyst, Nemertes Research. John advises key enterprise and vendor clients, conducts and analyzes primary research, and writes thought-leadership pieces across a wide variety of topics. Today’s digital economy and its associated requirements for your business are constantly evolving. From headquarters to branch offices, unified communications is key to building a better bridge for collaboration across your distributed enterprise. Join us on July 26 at 1 p.m. ET for “Unified Communications: Creating a Modern Collaboration Model,” a webinar from Comcast Business, to understand how hosted capabilities are evolving to create more unified communications and greater productivity for an increasingly mobile workforce. -John Guillaume, vice president, product management and strategy, at Comcast Business, is responsible for managing its voice, unified communications, and SaaS portfolio. He is also head of UX for Comcast Business and leads the software developers and designers. -Diane Myers, senior research director, VoIP, UC, and IMS, at Infonetics/IHS, leads the company’s arrier VoIP/IMS and enterprise telephony coverage, authoring numerous market share and forecast reports, service provider and end-user studies, and Continuous Research Service (CRS) research notes. Legacy MPLS networks weren’t built to optimize network visibility. In an age when nearly 80% of workloads are in the cloud and almost every function is tied to an application, transparency is critical to managing traffic. Gaining the control you need starts with taking an app-first approach. Software defined networking (SDN) is critical to gauging the breadth of all your applications and to effectively steering traffic to maximize performance. In “Navigating the New, App-Centric Reality,” our panelists will explore how the internet has changed radically in the past 10-15 years; network and infrastructure challenges; how SDN offers greater control; and more. • John Burke, principal research analyst, Nemertes Research, advises key enterprise and vendor clients, conducts and analyzes primary research, and writes thought-leadership pieces across a wide variety of topics. • Jody Hagemann, director of product management, Comcast Business Services, focuses on service operations design, new product launch, product-to-product migration, and lifecycle management. Her current role is developing the Comcast Business ActiveCore℠ platform. • The keys to unlocking bandwidth constraints. Register for “Navigating the New, App-Centric Reality,” on Thursday, May 24th, 1 p.m. EST, today! While your customer-facing and operational branch locations are distributed in nature, they’re increasingly becoming the center of your business. In today’s digital business environment, it’s more important than ever to equip the “edges” of your organization with new capabilities—including network capacity and performance—to meet the evolving expectations of your customers, employees, and partners. Many branch offices are under-equipped to take advantage of new business opportunities, and today’s IT executives are in a unique position to undertake branch office modernization, thus leading to the delivery of new and improved customer experiences and capabilities to grow the business. Everything evolves, and the current evolution in business speed and performance has been led by the cloud. From data centers to workloads, it’s impacted and shifted the way we process and deliver information. In fact, according to the 2018 Cisco Global Cloud Index, cloud data center traffic will represent 95 percent of total data center traffic by 2021 and SaaS workloads will comprise 75 percent of total cloud workloads. In addition, virtualization in the cloud and across your business network serves as a catalyst for greater automation. Taken together, infrastructure modernization and automation are critical to effectively meeting the increasingly rigorous demands to create new customer experiences and operate more effectively. - Features of a scalable, cost-effective, strategic SDN solution. - John Burke, principal research analyst, Nemertes Research. John advises key enterprise and vendor clients, conducts and analyzes primary research, and writes thought-leadership pieces across a wide variety of topics. - Allan Langfield, executive director, product management at Comcast Business, manages challenges and implements effective strategies for growing and enhancing product, process, and organizational capabilities. It’s no surprise that digital transformation is on the minds of enterprise businesses. In fact, according to a recent IDC survey of IT professionals, 94 percent of respondents indicate they are planning or have digital transformation initiatives under way. Connectivity is key to this transformation, and SD-WAN can help maximize that connectivity. Join us on Tuesday, October 24th at 1:00 p.m. ET as expert panelists discuss the foundations of SD-WAN, its role in digital transformation, and how it can be adopted for your enterprise. •Jeff Lewis, vice president of product management for Comcast Business focused on next-generation networking, cloud, data center, Wi-Fi, and Internet solutions for business. Getting there may be less complex than you think. “Digital transformation” isn’t necessarily a quantum leap in technology or even a linear progression—it’s a change that takes place across a spectrum. In fact, you’re likely already in the midst of some form of it. A recent IDC survey reveals that companies across all sectors are applying connected digital technologies—mobile apps, social networks, cloud services, big data and analytics, etc.—to achieve cost reductions, revenue increases, and service improvements. Clearly, digital transformation is well underway. The question is, how far along the continuum are you and what does it take to fully realize digital transformation? In “Taking Digital Transformation Beyond the Buzz”, a webinar from Comcast Business, our knowledgeable panelists will discuss how rapid changes in technology and culture have impacted changing infrastructure needs; how mobility, analytics, social media, IoT, and future AI workloads are driving greater digitalization and the need for scalable, agile systems; the need to eliminate siloed environments to enable growth; and the ways to assess where your company is on the path to change. 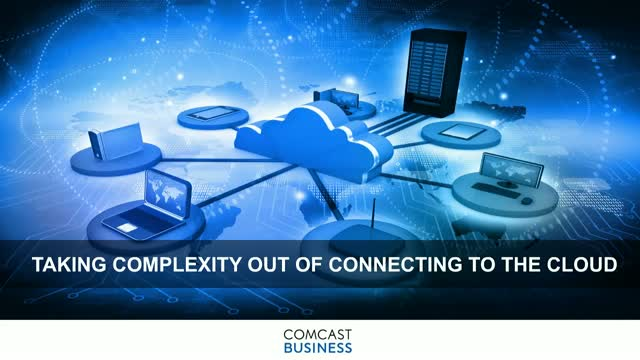 •John Keller, director, Product Management Data Center/Cloud Connectivity for Comcast Business. John is responsible for solutions and services focused on enabling customers to leverage multi-tenant data centers and cloud providers through private, direct connections. Register now for this webinar broadcast on October 18th at Noon EST, today! In an environment of rapidly evolving economic and technological change, how can you stay ahead of the competitive curve? The key is digital transformation. It gives you the power to unlock greater cost efficiencies, streamline solution deployment, raise your customer experience game, and much more. Join John Burke, Principal Research Analyst at Nemertes Research and Jeff Lewis, Vice President of Product Management for Comcast Business, as they walk you through what it takes to leverage digital transformation for your operation.